Well I mentioned last week that I love peanut butter and I would be adding more peanut butter recipes including this one! It is a triple threat peanut butter fudge! It’s delicious and addicting, and surprisingly not too sweet! This is a great recipe if you have a party to go to or need to make a gift for someone, just make sure they are NOT allergic to peanuts, because this would kill them! 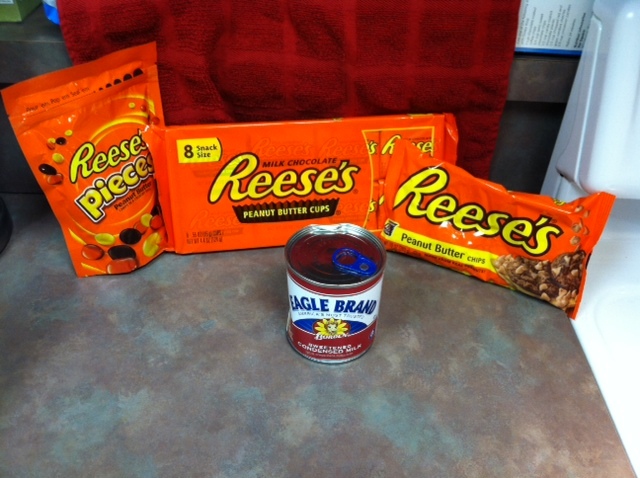 2 Bags of Peanut Butter Chips – I went with the Reeses brand and you can see from the picture why. Start by melting the peanut butter chips and the condensed milk, on LOW (be very careful not to burn the peanut butter, or you may never use that pan again!). Once those are melted stir in the vanilla then remove from the heat. Pour HALF of the melted peanut butter into a GREASED pan. Then lay crushed peanut butter cups on top. After the peanut butter cups have been placed add the second half of the peanut butter melted mixture. Once that is complete sprinkle the Reeses Pieces over the fudge. Let cool for an Hour – I put it in the fridge to ensure it really hardens. Cut and Enjoy! I promise you friends, family, and coworkers will be begging for more! Living in Italy for three months of my life I learned to love nutella! I have always been a peanut butter kid and when I got to Italy and found out it was 8 Euro for a tiny jaw of peanut butter I knew I needed to find a new staple for my time there. Then I found nutella… everywhere! There was nutella gelato, nutella cookies, it was everywhere and it was cheap! Then I got back to the states and my parents didn’t understand why I was eating chocolate on my toast at 8am in the morning, so instead of eating it for breakfast I have now discovered a few recipes that include nutella in its rightful place…. for dessert! 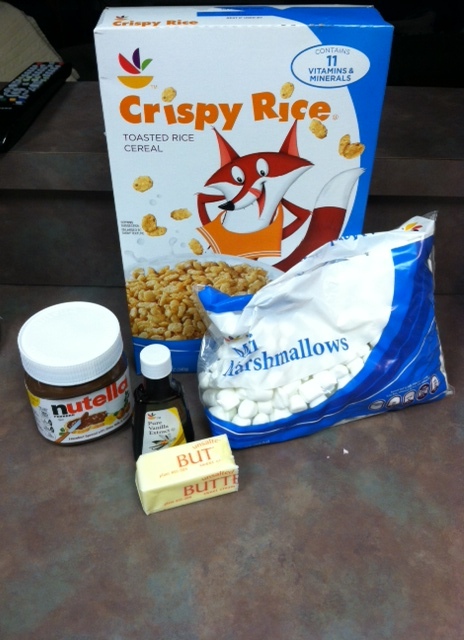 Below is my first experiment with nutella for dessert and I hope you like it as much as my coworkers did! 1 Bag of Marshmallows – 10 ounce bag. Start by melting the butter over low-medium heat, in a large pot (remember we are adding the cereal into this bowl too!). Then add the marshmallows and stir constantly till they are melted. 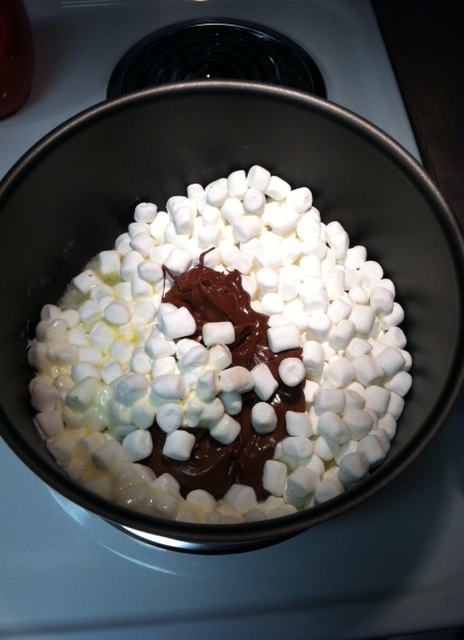 Once the marshmallows have melted add the nutella and vanillia and stir. Once those have been mixed take the pot off the stove and add the cereal. The nutella mixture should cover all the cereal. In order to start the next step, make sure you grease your pan ever so slightly so you can get at these delicious treats once they have harden. After you have greased the pan you can lay out the cereal and nutella mixture. Let it sit for about an hour to cool and harden slighty. Once they are cooled you can cut them up and serve! Enjoy! 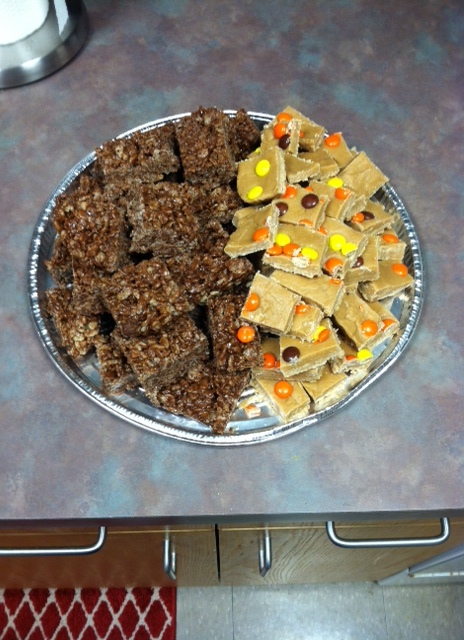 *This picture also shows the triple peanut butter fudge I will be sharing later this week!